Countless heavy metals enter the body every day via our water, thermometers, lead pipes, arsenic released into the environment in the process of creating chemicals and metals like copper, zinc and lead, they seep into our bodies through exposure to pesticides, batteries, steel, alloys, dyes, and so much more. A mass amount of heavy metals can impact health immensely, causing fatigue, toxicity, improper functioning of vital organs, and could eventually lead to serious disease. Luckily, for us, nature always has a way. Green Heart Juice has a formula that was created to pull heavy metals from the body: The Slayer. The Slayer is made up of organic cucumbers, organic cilantro, organic green apples, organic cabbage, and organic lemon. All of these things are incredible at doing their job, and together they push heavy metals out of the body. Organic cucumbers are full of vitamins A, C, folic acid, magnesium, molybdenum, potassium, silica, ascorbic and caffeic acids and much more. Cucumbers are known for their cooling effect, as well as their ability to soothe swollen skin, especially around the eyes. Cucumbers are also large diuretics, which helps control blood pressure, manage diabetes, and dilute acid masses within the body, particularly in the urinary bladder, kidney, liver and pancreatic functions. Organic Cilantro attaches itself to the heavy metals in the blood and body tissue, eliminating them from the body. Cilantro has been known to cross the blood-brain barrier to eliminate heavy metals from the brain. Once the acids are broken down from the cucumber, cilantro can pull these metals through the body and be eliminated. 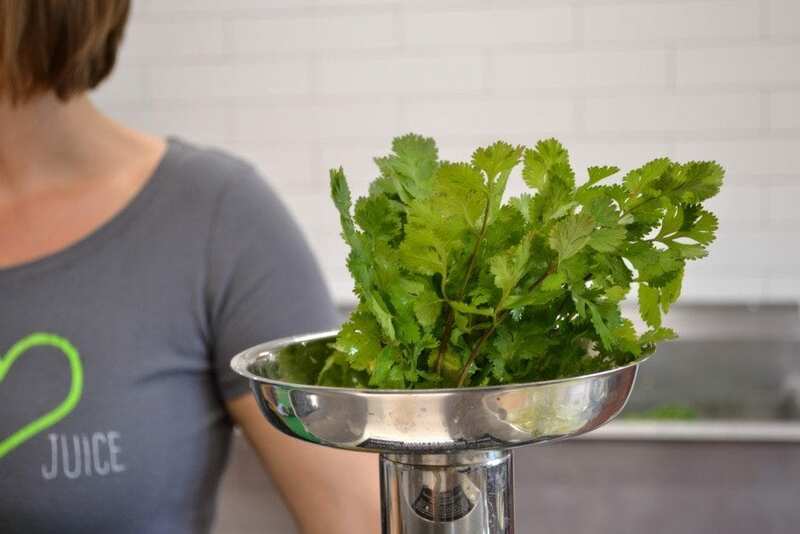 Cilantro also has vitamins A and K, aiding in liver function and the pulling of heavy metals. Organic cabbage, like cilantro, binds with bile acids in the digestive tracts resulting in the lowering of cholesterol. Cabbage has also been known to contain sinigrin, which is a glucosinolate that has been known to aid in cancer prevention. The World’s Healthiest Foods website wrote, “The sinigrin in cabbage can be converted into allyl-isothiocyanate, or AITC. This isothiocyanate compound has shown unique cancer preventive properties with respect to bladder cancer, colon cancer, and prostate cancer.” Additionally, cabbage is known for its antioxidant rich make up, and it’s anti-inflammatory benefits. All three of these things result in healthy, glowing skin due to the cleansing of the cardiovascular system and digestive tract — beauty certainly is more than skin deep! Organic green apples and organic lemon have amazing benefits as well. Organic, raw lemon juice purifies the blood, maintains pH alkaline, aids the immune and digestive systems, and a whole lot more. Organic green apples are amazing for the skin, hair, and bones. They help regulate the body’s blood sugar levels, aid the cardiovascular system, and they are full of antioxidants. All of these ingredients work together to dilute acids, eliminate heavy metals, and add rich antioxidants that aid the digestive, immune, and cardiovascular systems which yield to cancer fighting, anti-asthma, liver function, benefits, among many others. Green Heart Juice is proud to provide you with a drink that tastes great and will keep you glowing from the inside to the out.